Sawyer optimizes cutting and accounting of warehouse stock! Efficient optimization algorithm, broad range of documents generated by the software, warehouse stock accounting capability and intuitive user interface make the system an invaluable aid in production for business of every description. 1. Functionality Specification of the SAWYER cutting chart generation and stock accounting system. job generation based on the products designed in Woody software without manual entry of part dimensions. automatic generation of labels on the commercial grade rests, product parts. integration with the Woody Case Furniture and Niche Cabinet Design System. 2. List of documents, which may be received using the Sawyer system. The Sawyer cutting system is intended for generation of jobs for cutting, cutting charts for rectangular parts made from sheet materials, and warehouse stock accounting. Sawyer's functionality includes ample opportunities of job properties management, a system of setting for saw-cutting equipment, accounting and actualization of the warehouse stock. Core controls of the SAWYER interface and their interaction. 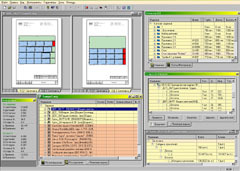 A typical look of the software interface. 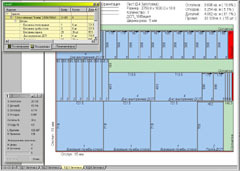 All the main windows of the program are shown. The size and configuration of the windows are easily set and combined. 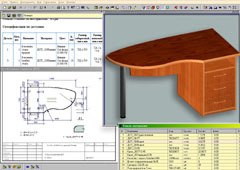 The directory is generated by manual entry of the product part dimensions or using the Woody case furniture and niche cabinet design software. In this mode, any products created using Woody, will be entered into the database for further use for the job generation. The job will be generated based on the dimensions of parts, number of edges and fittings. This automates the process of the project development and generation of the process documentation on a single product or a group of entities. Cutting jobs are generated based on the product directory or directly by entering the parts' parameters in the job. The database manager channels the data on the products (or an any set of parts) to the job window. The same database is used to retrieve entities to be used as blanks from the warehouse stock. In the process of cutting, Sawyer acts based on the orientation of the texture, process indents, part size margins, saw cut width, and the waste data. Cutting chart drawings show the cut lines and the sawing sequence. Statistical data are gathered dynamically on every job and each sheet separately: area of blank, total area of the parts, total area of the rests, the area of waste, percentage of the rests, percentage of waste, saw cut length, with estimation of their quantity, and cost. 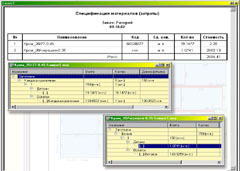 The picture shows a sheet cutting chart drawing (bottom left: optimization status window with the job information, top: cutting job window with the information on products arrived for cutting). The drawing shows texture orientation, material type, blank sizes, saw cut width, and statistics. 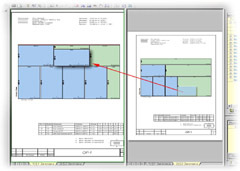 Manual editing of cutting charts is supported: parts movement between blanks, change of saw cut structure, part rotation on the drawing, provided that texture direction (yet another option) is not fixed. 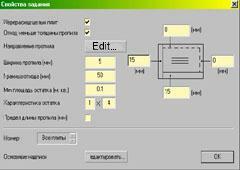 Users are allowed to skip cutting of individual pre-selected parts by marking them as "unmovable" in the job window, thus generating the required sequence of the parts cutting. 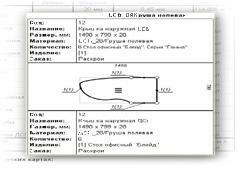 In addition to cutting chart drawings users may generate process charts for the parts edging which show more detailed information on edging, including curvilinear parts, among other things. The warehouse management module allows recording the receipt and writing off of the materials in the warehouse, such as WCB, WFB, fittings, glue, edge tape, etc. In addition, users may generate balance as of any date, having determined the total quantity and cost of the materials available in the warehouse.